Cheimonophyllum is a small and fairly obscure genus of white-spored woodrotters with sessile fruitbodies. Saprobic, decaying conifer and hardwood logs and larger branches. Only one species occurs in our area. Since there are many, many mushrooms matching this general description, identification is dependent on familiarity with other similar genera. Crepidotus have brown gills and spore prints, and usually more colored caps. The most similar is likely C. variabilis/C. herbarum, but that grows on grass stems. Also similar is Clitopilus hobsonii, but that species has a strongly sheet-forming mycelium and pinkish-salmon gills and spore print. 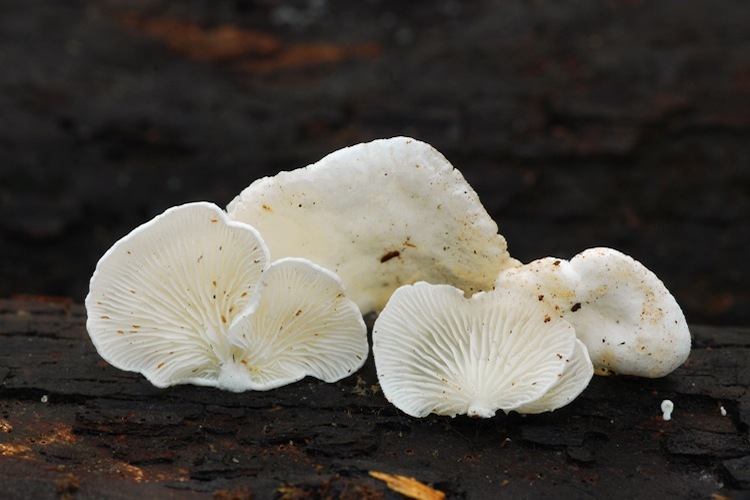 Similar-looking species in Hohenbuehelia are more gelatinous, and Panellus mitis is rubbery-textured with a small but distinct pseudostipe. Although also similar in aspect, Rimbachia is a moss-dwelling species. The uncommon Lentinellus vulpinus has serrate gills and more gelatinized tan-brownish cap.